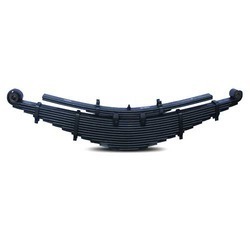 With assistance from highly qualified and experienced professionals, we are engaged in offering a huge gamut of Leaf springs assembly. Offered products are demanded in the automobile industry for the purpose of assembling vehicles. Our offered products are stringently tested on several parameters by our quality experts so as to supply a defect free range. In order to fulfill the growing demands of our esteemed clients, these springs are offered in customized shapes.